The Early Years are a period of huge potential learning which are optimised when an ‘early childhood’ approach is balanced with some explicit instruction. This seminar explores what research explains are the most essential preliteracy skills for 3 & 4 year olds; phonemic awareness, alphabet knowledge and oral language ability (i.e. vocabulary and the ability to speak in grammatically correct lengthy sentences). This seminar explores how children typically read 1st, spell 2nd and write 3rd. The seminar also highlights the pre-literacy skills that facilitate children’s ability to acquire early literacy skills. The Foundation school year is a complicated year level to teach. Students can achieve within this crucial year if educators are knowledgeable of the process. A proportion of the school year must be allocated to pre-literacy skill development and a proportion of the year must be allocated to the emergence of early reading, spelling and writing. 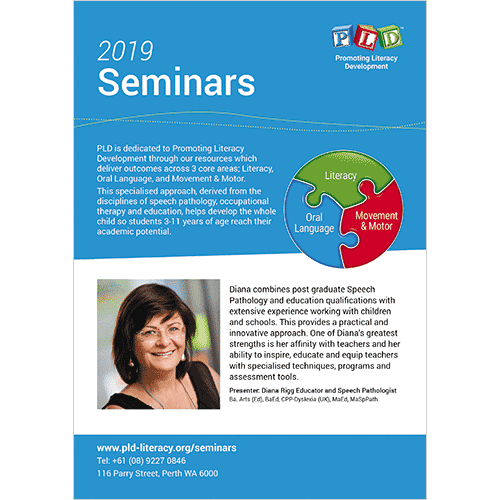 This seminar explains and demonstrates explicit synthetic phonics instruction and how focused instruction can be delivered to a class with a range in student ability. Repeated reading and phonic dictation are presented as mediums of facilitating the transfer of the ‘word attack’ skills into writing. This seminar will also outline time efficient decoding and spelling assessments designed to identify the range in ability so teachers can be more focused in their instruction. By middle and upper primary students typically present with a diverse range in ability. Some students still require a synthetic phonics approach while others will have progressed beyond this and require increased instruction on word meaning and opportunities to transfer their complex words into writing. A non-standardised spelling placement test is provided so the speciic range in student ability can be determined. The focus of the seminar is how to allocate a proportion of the literacy block to the explicit instruction of spelling ‘word attack’ skills. This 2 hour session is designed for Principals, Deputies and/or Literacy Coordinators and provides an overview of what PLD’s implementation looks like within a school. The session highlights the processes that will enhance the classroom implementation and focuses upon the school-based tracking of student progress and provides tools to assist with time-eicient tracking to provide a catalyst for establishing consistent practice within a school. See 2019 seminar dates and register here.